The Achilles tendon is the strongest tendon in the human body. Its purpose is to connect the posterior (back) lower leg muscles to the heel of the foot. This tendon is responsible for facilitating all types of movement, like walking and running. Since this tendon provides an enormous amount of mobility to an individual, any injury to this tissue should be immediately examined by one of our podiatrists. The most common injuries that can trouble the Achilles tendon are tendon ruptures and Achilles tendinitis. Achilles tendinitis is the milder of the two injuries and can be recognized by the following symptoms: inflammation, dull to severe pain, an increased flow of blood to the tendon, and thickening of the tendon. Diagnosing Achilles tendonitis can be performed through clinical examination that begins with a thorough history, followed by a physical exam. In-office imaging using ultrsound may help with diagnosing the severity of the injury. An MRI may also be ordered to rule out possible tears and reveal the extent of the inflammation. Treatment for Achilles tendonitis can involve a number of options and will depend upon the severity of the tendonitis. 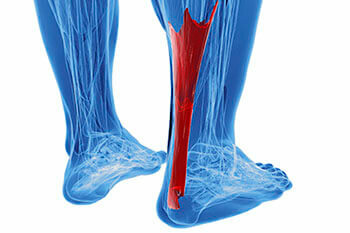 An Achilles tendon rupture is more difficult to heal, and is by far the most painful injury. It is caused by a sudden ripping or rupture of the tendon that can be felt by a "pop" in the lower leg. The symptoms are immediate and can lead to difficulty walking all the way to complete immobilization. If a rupture or tear occurs, operative and non-operative methods are available. Depending on the severity of the injury, recovery time for these types of issues can take up to a year once treatment begins. Simple preventative measures can be taken as a means to help reduce the risk of injury; however, they will not completely prevent one from occurring. Prior to any movement, taking a few minutes to stretch out the tendon is a great way to stimulate the tissue. Calf raises, squats, leg curls, leg extensions, leg raises, lunges, and leg presses are all suggested ways to help strengthen the lower legs and promote Achilles tendon health. Many problems arise among athletes and people who overexert themselves or who do not properly warm up before beginning an activity. Proper, stable and supportive shoes that fit correctly can also decrease tendon injuries. It is very important to make an appointment with one of our expert Podiatrists if you believe you have an injury to the Achilles region. Further damage could result in severe complications that would make exercise and activities of daily living difficult.